My adorable little nephew isn’t able to eat dairy, which means his (favorite) Aunt Laura had to do a little bit of experimenting before his visit last week. 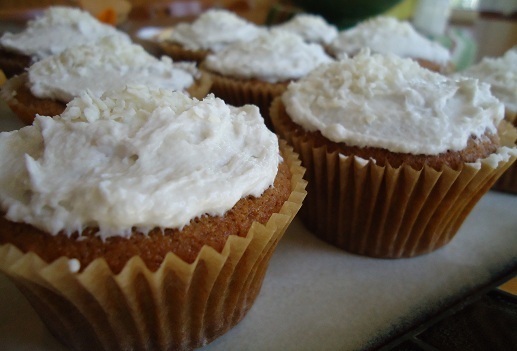 I came up with a very delicious and healthy Coconut Cupcake recipe that all of my kids loved! Coconut Milk is awesome stuff and works very well for baking. (I had purchased a case of Thai Kitchen Coconut Milk to experiment with and to have on hand.) 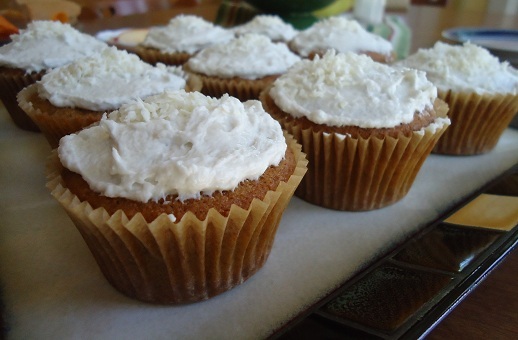 We don’t need to eat dairy free at our house, but I will be making these cupcakes again! Mix all ingredients together with beaters. Spoon into 24 paper lined cupcake pans. Bake at 375° for about 25 minutes or until a toothpick inserted in the middle of the cupcakes comes out clean. Allow the cupcakes to cool completely before frosting. Ever done any cooking or baking with Coconut Milk? I’m excited to experiment more with this great product! I believe I read on someone’s blog somewhere in our electronic world that you can take cold coconut milk and whip it like whipping cream. I don’t know if this counts as cooking or baking, because it didn’t involve any heat, but I just made something yummy with coconut milk tonight. It was a shake, and it was not dairy-free, but it was very tasty. The ingredients were coconut milk, lime juice, bananas, vanilla ice cream, vanilla extract, sugar and ice cubes. It was refreshing and creamy and a nice change from our normal, healthier green smoothies! I cook with it all the time. I use coconut milk in the carton for savory dishes. It has more of a cow’s milk consistency for things like cream of soup recipes and the like. I also substitute coconut oil for butter. Four of my eight children have a dairy allergy. I’ll be trying this recipe soon. Thanks! How funny! Just yesterday I used your Vanilla Muffin recipe using the coconut milk just like you did here, but with fresh spelt flour. I used the lesser amount of sugar, and we sure enjoyed the muffins! I use coconut milk for a lot of our baking and eating. It works best, I think, in sweeter baked goods rather than the savory. Coconut milk kefir makes an excellent base for smoothies. You can also make a really yummy ice cream: one can of coconut milk, 1/4 cup of cocoa powder, 1/4 cup of coconut sugar, and a bit of vanilla. YUMMY! The link that Palm Shortening is linked to on Amazon is for Oranic Vegetable Shortening. Is that the same thing as Palm Shortening? Thanks! Yes, the ingredients for the Organic Vegetable Shortening is “palm oil”, so I believe it is the same as the Palm Shortening I get through Tropical Traditions. I made whole wheat coconut donuts for my kids yesterday. Used coconut milk for the liquid and substituted unsweetened coconut for 1/3 of the flour. They went nuts for them. Didn’t even know how good they were for them. I found using coconut milk in baking you can cut back on some sugar/sweetener too. Could you make these gluten free, too, by using coconut flour? Just curious. I know the proportions are different. I just made these and 4 out of 5 in the family liked them! We just ate them plain. They were super moist! Thanks for the recipe. I was so excited to find a dairy-free recipe on your site! You have great recipes and I enjoy your site, but as I started trying to eat in a healthier way, I found out (just) that I am allergic to dairy; and therefore, I have to modify many of your recipes. This one was a real bonus! Thanks, Laura, they look great. I’ll have to try this one. I’ve made curries but I tasted one in a restaurant recently and when I got to making it at home, it has coconut milk and oil in it and tastes just wonderful! I just used this recipe this morning for my brother-in-law’s wedding. I substituted a gluten free all purpose flour for the whole wheat and toasted the coconut for the top and they were fantastic. what a great recipe, thank you! I only have coconut oil that I could put in fridge to firm up for frosting or butter what do you think?